Cookery & Food Experience, what I can offer you. TRUFFLEicious is based at Great Chalfield, Wiltshire, in a stable we converted into a 5* hygiene registered kitchen, within the grounds of Great Chalfield Manor. I have been working as a private cook/recipe developer for more than 40 yrs, mainly in private family houses, for Polo functions and at Harrods. During this time I have built up a large repertoire of my own recipes, which I have created & developed over the years, to suit our ever changing tastes & dietary needs requirements. “My aim is to supply 100% Homemade food, made from fresh, natural, local ingredients, which contain NO nasties”. I am a great believer in cooking food from scratch, using fresh natural ingredients. You may like to read my related article Taste have we lost it? Creating recipes from your own product. Assisting you in creating a new food product. Creating recipes for all dietary requirements. Writing food & recipe blogs for your business. Advise on food legislation & regulation for the small food business. You choose what you would like to learn to cook. Brush up on your basic skills. Learn to cook dishes for various dietary needs. Batch cooking from scratch – time management. Ecconomic purchasing & cooking for families. How to use your leftovers. These are only suggestions, we are able to accomodate any aspect of food & cookery. TRUFFLEicious is registered as a food business with Wiltshire Council & our Scores on the Doors are 5*. We hold current public & product liability insurance & Food Hygiene Certificate. Good morning Foodies, I hope you all had a fantastic Christmas & are not suffering too much from the excesses of the festive season. Your waist band may be feeling a little bit tighter today & its a certainty that the only thing lighter is your purse. But what about your fridge? Is that suffering from the same post Christmas fatigue? Is it also feeling stuffed & groaning with the weight of all those leftovers. Are you just going to sit on the sofa & flick through that nice glossy cook book or, are you going to get creative & turn those leftovers into some tasty, healthy meals which will not only loosen your clothing, but will also provide you with the satisfaction that you have saved yourself some hard earned cash by getting creative with those leftovers. .
Below you will find my basic recipe, which you can turn into three different dishes. Depending on what stock you use & the other ingredients you choose to add, this basic recipe is gluten-free, dairy free, vegetarian & vegan. Is part of your 7 a day and contains fibre, protein, vitamins & minerals. 6, large Carrots, chopped or sliced. 250g Green Lentils thoroughly washed & drained. 4. Ltrs of stock from the simmered leftover carcass of a chicken, duck, goose, turkey etc. For my recipe I used the water from boiled gammon joint. For vegetarian & vegan, omit the meat stock & use the water reserved from boiling vegetables (not potatoes) or water. Heat the oil in a large saucepan & gently fry the vegetables or 10 mins over a medium heat. Pour over the stock, veg water or water, bring to the boil, reduce the heat & simmer for 45 mins. Add the drained lentils, & herbs, bring to the boil again, reduce the heat & simmer for a further 40.mins. Season to taste. Using 1 portion of the Lentils, turn into a saucepan & add either fresh, soft tomatoes, chopped or a tin of tomatoes, 1 clove of chopped garlic & any left over meat or veg you have. Bring to the boil & simmer for 5 Mins. Serve in bowls with crusty bread & Parmesan Cheese sprinkled over. Turn the 2nd portion of lentils into a serving bowl. Pour over 4 Tbspns Garlic Salad Dressing & allow to stand while stir frying some finely sliced Cavolo Nero. Stir into the Lentils along with 1 peeled, stoned & sliced avocado, chopped yellow pepper & halved plum tomatoes. Serve either as it is or strewn with smoked salmon, cooked prawns or hard boiled egg & chopped Chives. 3. Stuffing for vegetables or Wraps. Turn the 3rd Portion of Lentils into a bowl , add stoned halved olives, Sundried Tomatoes, Chopped capers & anchovy fillets along with a crushed clove of garlic. 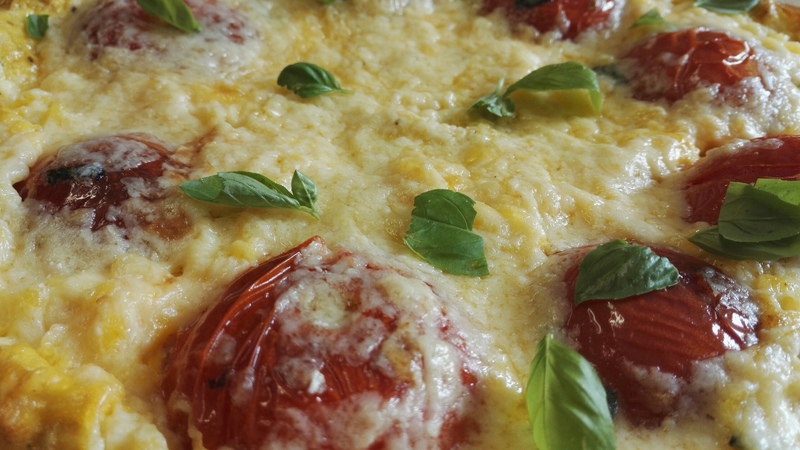 Mix together with some chopped basil & used to stuff Tomatoes, Peppers, Aubergines etc Bake in a medium oven for 30 mins. Or use the mixture cold as a filling for wraps. Well foodies. Hope I have given you some ideas on what to do with those leftovers, use what ever you have to vary the flavours & don’t forget #loveyourleftovers. This recipe was demonstrated in the BBC Radio Wiltshire kitchen on the Shaun Hodgett Show on Thursday 28th December 2017, where I was in conversation about #loveyourleftovers with Holly Rattley. Should you have any questions or comments on the above, please use the form below. 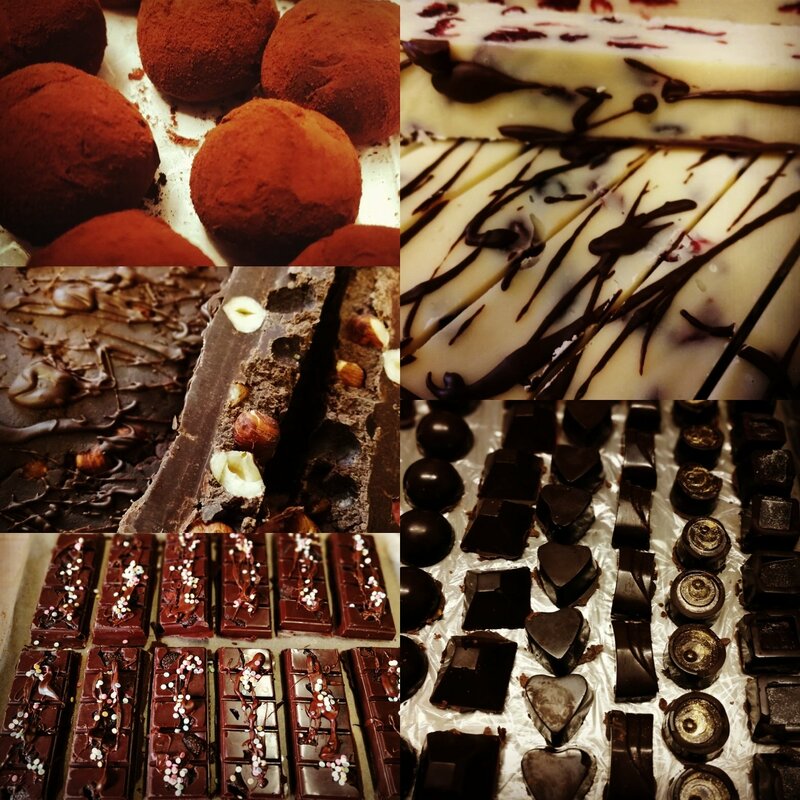 Here at TRUFFLEicious, as the nights draw in & the season changes, we have been devoting our time to recipe creation. As the festive season draws nigh my thoughts turned to that great overload of rich, sugary foods, which become, in these modern times the spirit of Christmas. “Hark the herald angels sing”. Our new recipe creations have been born. THE ultimate #Christmas #Cakes. Rich, moist, dark, fruity & nutty and above all. #Gluten & Dairy free. My first cake ( pictured above) is Beetroot, Apple & Hazelnut. The sugar content has been lowered, as both the apple & dried berries add an element of sweetness to this rich moist cake. Not being a fan of sugary icings, marzipan or butter icing, I have decorated the cake with a mixture of curd cheese & natural yoghurt,which adds a creamy, refreshing contrast to the richness of the cake. Off course, if you are totally dairy free, the topping would be a NO NO. Is again, gluten & dairy free. The picture on the right is decorated with the same topping as above and therefore not suitable for those totally dairy free it is sprinkled with grated lime rind & a few cranberries would also look effective. The cake on left is just dredged with icing sugar, for a seasonal effect & both would look good as a centre piece with a red pillar candle stood in the middle. Once again a rich, moist nutty cake, but with a slightly higher sugar content with the addition of maple syrup & homemade caramel and again the topping contains yoghurt & curd cheese. This cake also contains an amount of gluten as it is made with Spelt, which give it a nice nutty taste & a rich dark colour. All the above cakes, could also be served as desserts. They keep well stored in an air tight tin, but if topped with the yoghurt & curd cheese, need to be stored in the fridge. Not suitable for people with NUT allergies. In my next blog I will be dealing with gluten/Dairy free Chocolate Cakes & Mousses. You can also hear me on BBC Radio #Wiltshire. 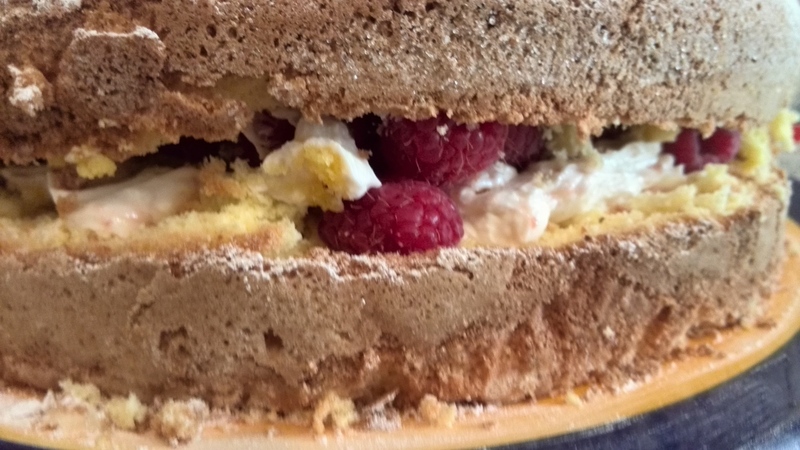 Sue Davis Show on Sunday Mornings at 10.15 for the next 6 weeks talking about recipes from this blog. Good morning fellow foodies. I hope you all enjoyed your Christmas? you are probably feeling a few kilo’s heavier & a few pounds lighter today!! To address the balance, here are a few tips & recipes to help you use up those leftovers. After all, do you really want your hard earned cash, dumped in the bin? If you were up early enough, you will have heard me on The Graham Rogers, Morning Show BBC Radio Wiltshire at 8.50 this morning, sharing these ideas, with the good people of Wiltshire. Left over turkey breast can be sliced into finger sized strips, dipped in beaten egg & tossed in a mixture of Polenta & grated parmesan. Leave in the fridge for 30mins. Fry lightly in olive oil, turning once & serve with a dip of pesto, mixed with mayonnaise, for the Italian touch. If its Spicy you are after. Follow the above, but replace the ingredients as follows: Dip in beaten egg & a Tbspn Soy Sauce & coat in sesame seeds. Serve with sweet Chilli Sauce. Boil some macaroni. Make up a cheese sauce, or use a can of Campbells condensed Tomato Sauce. Layer in a casserole, Macaroni, cooked turkey chunks, chopped peppers, sun-dried tomatoes, olives etc. Finish with a layer of macaroni. Pour over the sauce, or soup diluted with a little of the Macaroni cooking liquid & sprinkle with grated cheese. Bake in a medium oven for 20-30mins. 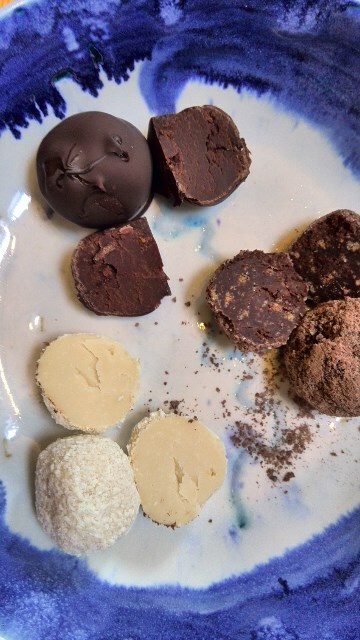 Recipe for savoury Truffles can be found by clicking the blue link. Have you looked in the salad drawer? I bet a sad looking lettuce & cucumber, lurk there, together with a few spring onions, the odd pepper & that bag of healthy shoots, that would go with….. you can’t remember what! Well dig them all out, heat some oil in a large saucepan & throw them all in. Saute for a few minutes with a tspn cumin, add some veggie or chicken stock & bring to the boil. Simmer for 30mins & blitz with a hand blender. Season & serve with a spoonful of Greek yogurt on top. Make a basic custard mix, allow to cool, stir in 500ml double cream & 1 tbspn Brandy. Process according to your manufacturers instructions, 10 mins before the end of freezing time, crumble in Christmas Pudding, or any meringues you may have left over. That it foodies. Hope you have found some inspiration to use up those leftovers. Have a great Boxing Day & Happy New Year. Its a bit of a poser this one, “Do real men eat quiche”? Well, to my mind, plonk a large slice of quiche, containing, bacon, eggs, mushrooms, cheese etc, in front of them & as long as you call it a breakfast quiche & they are not vegetarian, they probably do. Just look at it this way, the quiche in the header photo is just, breakfast on a pastry plate! Below, you will find the recipe for a man sized breakfast Quiche. The pastry recipe you will find as a previousChristmascountdownpost, by clicking the link. At the bottom of the page, you will also find some variations, which may also help you use up your Festive leftovers, when the time comes. In Day 13 of Christmas countdown you will find a couple of recipes for leftovers. Christmas present, can soon become Christmas past. By past I mean, “Past that best before date”. That’s why you need to learn to loveyourleftovers. We all buy too much food over the Festive Season, whether it be for the unexpected visitor who may drop byor just because we are tempted by a vast array of food choices.